Enjoy comfortable driving and high quality with the KW-NT3HDT. When you approach an intersection, freeway on/off ramps, etc, the KW-NT3HDT displays magnified view on the left side of the split screen. In this display, map indications are scaled up and the direction of the next turn is shown, so you can see them easily and prepare accordingly. 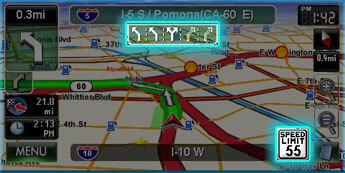 Users can operate audio functions while the KW-NT3HDT is in map display mode. Being able to change simple audio commands from the map screen makes it easy to continue navigating without changing back and forth from your audio display every time. Displays lane information when approaching a junction. Shows the legal speed limit for the road. 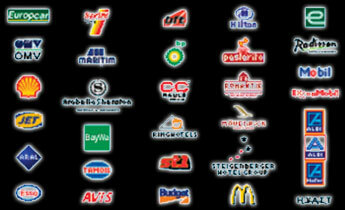 Displays easy to distinguish brand icons on the map. Choose the map view from 2D North Up, 2D Heading Up or 3D Heading Up. Choose the map and route colors from Day 3 Day Patterns and 3 Night Patterns. You can change the vehicle icon from these three types. Click on the icons to see them on the map.